I’ve been searching for a projectile motion activity/lab for my physical science class. I completely forgot about this one, and I’ve done it for years. We are going to make catapults from popsicle sticks, hot glue, rubber bands, and a spoon. I like this lab because the hot glue allows for rapid build and repair, and there is a definite need for repair and modification in this project. The kids typically build the frame from the popsicle sticks and then try to attach the spoon with rubber bands. The spoon is the launcher for the catapult. Usually, they find there is no way to connect the rubber bands, so they start adding little posts. The next problem they encounter is the rubber bands aren’t tight enough so the object doesn’t launch very far. They then tighten the rubber bands and the frame starts to collapse. So they need to go back and reinforce the frame. At this point one of three things happens. The catapult is improved and they start launching marshmallows. They realize they can rebuild the catapult rather quickly and so start all over and improve their design. The catapult falls apart, they attempt improvements, but basically give up. The picture isn’t a great example, but it is a starting point. 28 Responses to "Projectile Motion Activity"
I’m a Junior High student [7th grade], and I stumbled across this site while looking for a polar molecule diagram. Very helpful. (: I’d also like to say that I’m finding all these posts well done and very interesting. I loved this idea for an activity. I need to integrate both mathematics and science concepts in a lesson. I intend on using quadratic equations and pairing them with the projectile motion. Is there anyway you can send me any more info regarding the activity? Thank you. I originally came up with this project for a summer math program I was teaching. The teams had to create a poster with different shapes on it and then using areas of triangles, rectangles, etc, they had to calculate the probability of hitting the shape based on the ration of the area of the shape to the area of the entire poster. They then looked at the number of hits in the shapes compared to the theoretical probability. I’m not sure how you would know the values to use the quadratic. Typically, if you are solving for d, you would have d=d(0)+ v(i)t+1/2at^2. If you have a phototimer that you can use to determine v(i), you could solve this. I have to think about it some more. Anyone else have any ideas? One possibility would be to tape a large sheet of paper to a board and place the board on an angle on a table. Carbon paper may produce a trace on the paper which could be overlaid with a grid pattern? Use a heavy ball such as a steel ball bearing and roll it up at an angle. It should trace out a parabola which you could analyse using d = vt x 1/2 at^2. Alternatively I have used a hybrid version of your catapult idea and a video camera mounted on a tripod to film it as it is launched. Then use the video played back on a projector to trace out the trajectory on a board or sheet of paper to analyze it further. If you are a tech geek you may try using a video tracker to take it up a notch? hey do you have instructions or a lab writeup for your projectile motion launcher. It looks like fun and I owuld like to use it. No, sorry I don’t. It’s on my to-do list. My goal was to have them challenge each other to a distance and accuracy contest. This year’s crop didn’t get that far on their own. I will have more if I do this next year. If anyone else has lesson plans to use this, feel free to jump in. This is exactly what I was looking for! Thanks again, Scott – I hope the year is off to a great start! sounds very interesting, may i please have a copy of the activity. i really like this activity. could you please send me some more information about it? Sorry, I’m not meaning to be evasive. The key to a lab or activity like this is to NOT give the kids too much instruction. I usually make a bad version of the catapult intentionally so that when they decide to copy mine, they instantly see the need for improvement. As an alternative, you can use the picture at the top, but don’t let them study it. Most will try to copy the design and not think for themselves. 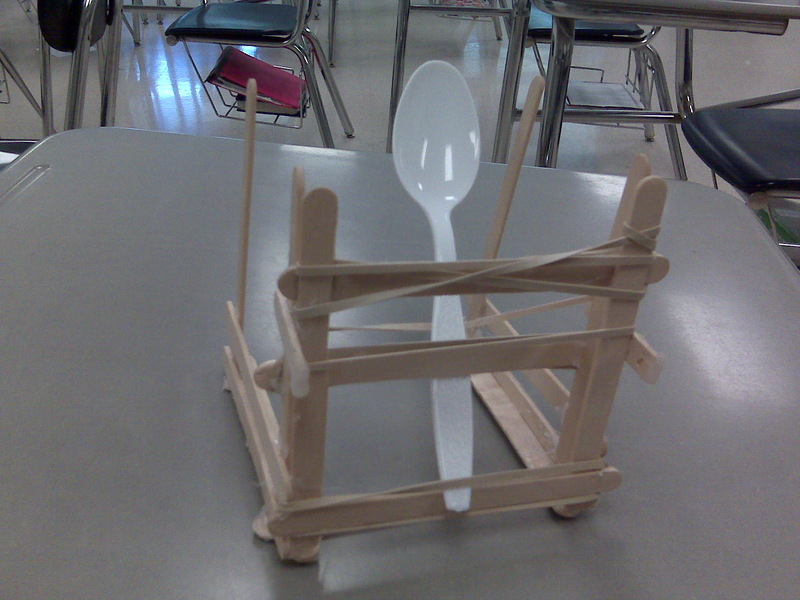 My instructions are usually – make a catapult using Popsicle sticks, hot glue, rubber bands, and a plastic spoon. You can cut the Popsicle sticks or break them. We are going for distance and accuracy. You may want to then take it a step further and penalize them for weight. I haven’t done that and I’ve seen some really beefy designs. The goal is to let the kids get creative and experiment with the design. I hope that helps. If you put together something more structured, I like to see it. hey do you know how to make a simpler one? How far does this catapult launch objects? Obviously there are a lot of factors, such as the weight of the projectile, but across the room 20 or 30 feet is common. Im a brand new teacher who just graduated from college a few months ago. This is such an awesome resource for me. I truly appreciating you posting this. Thank you!!! On my third try, making myself look like a fool. My name actually links to my class blog now. I love your blog. Your ideas are fantastic, I’m considering the switch over to standards-based grading because of you! Thanks Evan. I need to post a few updates and some minor changes that I’m going to implement, but the kids and I both love SBG. Love this lab! Do you give them a limit for the number of sticks they can use? would love to do this lab and need to know what to buy. I haven’t done this lab in about 5 years and I was thinking about using it with my engineering and robotics class this year. The material is pretty basic: craft sticks (1000 for $5 at the craft store), rubber bands and plastic spoons. You could open it up for them to use other material, you could assess a fee for each item used, or you could let them use as much as they want. I would grade them on accuracy, have them shoot at “castles” or bulls-eyes, whatever works for you. I usually use hot glue guns, but you can slow down the construction by using Elmer’s or another wood glue.